Every year we hear the usual gripes about how EA has spent too much of their resources on a card-collecting Ultimate Team mode that isn’t accessible to anyone unless you’re willing to shell out some real money for your team. While racking up credit card debt is certainly a surefire way to improve your team quickly (and also go broke), it’s far from the only way to put together a competitive squad that can go toe-to-toe with many of those same teams that have been built through the power of the Visa. In fact, Madden 19 offers plenty of ways people who are unwilling to spend a dime can keep up with those with deep pockets, if only they’re willing to spend some time and grind with purpose. Here are some helpful do’s and don’t’s to help with keeping both your team on track and your money in your wallet. Madden 19 gives you quite a few more solo challenges at launch than last year and these can yield some pretty valuable rewards that have a chance to become integral parts of your lineup for the foreseeable future. DO: Start by doing the challenges that will give you the best return on your time investment. The Campaign solos, for instance, will provide you with plenty of packs along the way, and you never know which pack you’ll get lucky on and pull a gem (I got Jadeveon Clowney this way! ).You’ll also obtain two 87 OVR players — one on offense and one on defense — if you push on through. Similarly, the Gauntlet challenges can be a little annoying (looking at you, rushing countdown) but you’ll have a couple more 87 OVR players for your troubles. Also, don’t be afraid to play MUT Drafts against the CPU to break up the tedium that can often accompany grinding solos for too long. DON’T: Conversely, try to steer clear of (or at the very least, put off) tackling solos that are going to take a while without giving you all that much in return. The Training solos are a good example as they offer you some power-up cards and training points, but those can also be obtained in other ways that don’t involve eating up a chunk of your time completing a series of solo challenges. Additionally, don’t be afraid to give up on any difficult challenges that are driving you bonkers and maybe come back to them later. Chances are your time can be better used elsewhere, and it will ultimately improve your health in the long run. The introduction of training points in Madden 19 provides the chance to upgrade certain cards, and with that comes plenty of decisions about how to acquire those valuable training points and then who to actually spend those training points on to improve. DO: Develop an understanding of how to get the most value when obtaining training points. The higher a card is rated, the more training points you get in return for quick selling it. 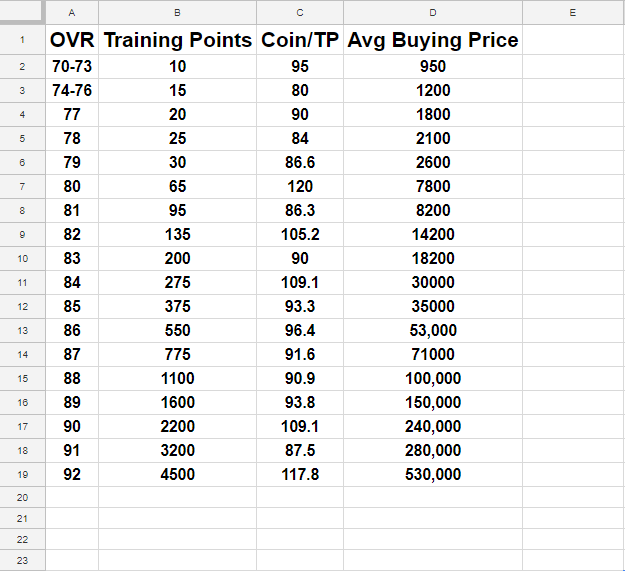 If you want to be incredibly cost effective about it when purchasing cards from the auction house, you’ll want to be aware of how many training points per coin you’re getting. Fortunately, someone on Reddit put together a helpful guide of how you can get the most training for your buck. It can also be a good idea to use training points on power-up cards for players you might already have a different version of in your collection, as you will need to use their other card(s) eventually to get them fully upgraded. DON’T: Whenever possible, avoid using any training points you think you might regret later. While the game does allow you to recoup training points that you’ve used by downgrading players you’ve already upgraded, you won’t get the full amount of training points you initially spent. If a player can only be upgraded to a maximum of around 85 OVR or so and you don’t expect any better versions of his card to be released at any point, it’s usually best to assume that it won’t be a card that will get much use for very long. As always, part of slowly improving your team involves building sets that will provide you some sort of reward for their completion. As well, you can complete short-term and long-term objectives while you play that will yield dividends. DO: Complete your daily objectives by winning a couple of games, purchasing a pack from the store ($500 to get a player if you want to be real frugal about it) and completing a set (turn a couple of low silvers into a high silver if your collection is looking bare). It will get you a quick sell card that could return a lot of coins. Start chipping away at completing some of the MUT Master challenges to begin upgrading Ryan Shazier — and remember to upgrade Ricky Williams every time you level up. If you’re into online play at all, the Series I trophies can be put to use in some sets with good card rewards, and if you finish solo challenges like Campaign and Gauntlet be sure to cap it off by completing those sets. DON’T: Some sets are really only meant to be completed by those who are willing to spend real money and part of learning to love MUT is coming to terms with that fact. Currently, these would include ones like Hall of Fame and Legends that simply require too many cards to complete without building up a significant amount of coins. Try to also bear in mind that some objectives (like MUT Master) are likely going to take a while to complete, so take your time and understand that Rome wasn’t built in a day. Some Madden players simply don’t have much interest in playing games online against other people and, while that’s perfectly acceptable considering how many other ways there are to play offline, they are missing out on some pretty good ways to improve their team. DO: Complete seasons either by yourself or in MUT squads to get Series 1 trophies, as these are valuable in completing sets and relatively easy to obtain no matter your skill level. One of the most important things to bear in mind is that there really isn’t all that much at stake in seasons games when you think about it because even though you can get better rewards by winning more games, you can always just start the season over again after four losses and try again. Eventually, you’re bound to start accumulating some trophies as long as you commit to playing enough and trying to get better. DON’T: Sometimes you have to remind yourself that Madden is just a game and there’s absolutely no reason to play online at all if you really don’t enjoy the experience. So when you run into that player (and believe me, you most certainly will) who insists on spamming the exact same play over and over again because he’s watched a few YouTube videos and learned all about which “money plays” are the hardest to stop, it’s perfectly fine to take a deep breath, concede the game to your opponent and find someone who’s interested in playing a genuine game of football. Yes, you’ll take a loss but it’s still better than tearing your hair out in an experience that’s far more frustrating than enjoyable. If you’re feeling lucky, you can always try buying packs in the store and hope you pull something good. Or, if you’d rather not leave things to chance and you want to know what you’re actually paying for, head to the auction and find that card you’ve been desperately seeking. DO: Scour the auction house looking for obvious bargains, which are cards that have an asking price way below their actual value. Granted, it’s often hard to get to these before someone else finds them first, but it’s as satisfying as finding a needle in a haystack — and can be even better if you’re finding someone like a full legend Randy Moss or Michael Vick hanging out in that haystack. When it comes to buying packs, pay attention to what cards will most likely be in a pack (which is now made easier thanks to being able to see the odds of what you could get in each pack), and take advantage of the packs that sometimes become available when you level up as there’s often some value in these purchases. DON’T: Try to keep from falling into the trap of purchasing certain packs based on seeing people post something on social media like “packs are juiced!” with a picture of some amazing pull they managed to get. In fact, packs are probably not “juiced,” they just managed to get lucky and you have no way of knowing how many tries it took them to eventually get that card. Don’t waste your coins chasing an incredible pull that will more than likely never even happen. With regards to the auction house, be very, very careful when putting cards up on the market as you do not want to push the wrong button early and end up posting a card for well under its value. If you do that by accident, congratulations, you’ve just played yourself and created a marvelous bargain opportunity for somebody else in the process.